“Olive Oil” 2016. Apple iPhone 6s Plus. Ah olive oil. The not so secret ingredient to the much touted Mediterranean Diet. So good for you. So good for your body! Now wait a minute you might say. Isn’t this site about cameras? Well yes indeed it is. And today, I just want to say a little about the 12mp camera on the iPhone 6/6s/6s Plus. In fact, this might apply to nearly all of today’s high quality cell phone cameras. First, about the shot. It may seem like a fancy restaurant, but I took this shot at a local Singa’s Pizza. Good, maybe even great pizza, but the joint itself is far from elegant. Anyway, I spotted this on the wall and the light was hitting it in that wonderful way that only light can. After nearly six years of iPhone shooting, starting with the original 3G, then 3Gs, then the 4, then the 5, now the 6, I must say that the cameras on the iPhone have evolved to a point where I really don’t need any of my fancy point and shoots for nearly ninety percent of what I shoot, especially if it’s going to be in daylight or in good light. The above photo, I think, is a good example. The color, the detail of the olives inside the bottles, and a wonderful balance on the shadows, highlights, and mid-tones. But one more very big positive. Of course, the ability to edit in camera and share your photos right away to your friends/fans on Facebook, Instagram or what have you, that seals the deal for most people. Yes, I know camera companies have incorporated wifi and sharing to their DSLR’s and mirrorless cameras, but the few I tried were very clunky in operation and not yet close to the smooth operation found in modern phones. As great as I’m making it sound, there is still one BIG negative about shooting with an iPhone. The negative is just that; the fact that it’s a phone first and not thought of as a “camera” even if there is a very advanced camera in there. It may be bad, but in a good way, people still respect you more if the shots were taken on an actual camera, even if the cell phone cameras have blurred the lines on what a “real camera” is. To most people, even the ones who will like your pics, the cell phone camera is just too easy. They know it. So it’s also easy to dismiss. That’s why film shooters still get a lot of cred. It’s film. It’s an old medium and yes, it does require a little (and sometimes, a lot) more work than it does with a modern DSLR, mirrorless or a high end cell phone camera. But if you put all this aside, take it out of your mind, there will come a time when you’ll have to say, you know what? This phone takes pictures as good as any other digital camera I’ve used in the past ten years. Again, not for every shot or every situation, but for ninety percent of what most people shoot, it’s perfect. No wonder more images are uploaded from the iPhone than any other “real camera” out there. No my friends, I’m not trying to convince you that the iPhone is better than say, a Leica Q. And no, I have not lost my love for vintage cameras. I am and will continue to use them as long as film is around. What I am saying is for me, I got to face reality. Shooting the iPhone may not be as cool as say, shooting a Ricoh GR, but it often will get the shots that under normal viewing distances, and certainly when posting small pics, will be indistinguishable from each other. That says a lot about how far cell phone cameras have come. 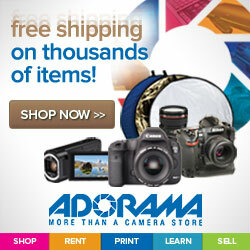 I have been notified by my good friends at Adorama that the Nikon D5 and D500 are now in stock!! If you’ve been waiting patiently for these awesome cameras, here’s your chance to grab one before they sell out the first batch. You may find them in the links below. Thanks for supporting Camera Legend and enjoy your new camera, I’d sure love to hear about it!